The second installment in Omnivore's career retrospective of the defining voice of the Bakersfield Sound is, while not as essential as the first, nonetheless a fine collection of hits and misses. For all intents and purposes, Buck Owens and the Buckaroos are the Bakersfield Sound. They are so intimately intertwined with the aesthetics of the West Coast-style of country music that it's impossible even to begin to discuss their differences from the slicker Nashville productions of the same era without pointing to Owens and company as the genre's greatest practitioners. Having met Don Rich in the late 1950s, Owens managed to cement a musical partnership that would become one of the more productive – not to mention lucrative – in that era. Together, their voices formed a single voice built around the close harmonies of more familial acts like the Everly and Louvin Brothers, Owens' voice owning the melody and Rich's shadowing him just above. So iconic and integral was their vocal pairing to the Bakersfield that, more than two decades later, Dwight Yoakam and Pete Anderson would adopt similar roles when they embarked on a recording career of their own. By the late 1960s, the group was running at peak performance, releasing a string of successful singles that, while perhaps not as well-known as their earlier hits, remained firmly within the mold they'd established earlier in the decade. Collected here in Omnivore's second installment of the group's complete Capitol singles, these recordings from 1967 to 1970 capture the declining years of commercial success. Opening with their number one hit from 1967, "Sam's Place", The Complete Capitol Singles 1967-1970 shows a group well-established in its sonic identity attempting to adjust to the rapidly changing times. There's nothing here that nods to the greater social and cultural changes then tearing the country apart – that was never really the point of country music – but thematically songs like "It Takes People Like You (To Make People Like Me)" still manages to tap ever-so-slightly into the zeitgeist. That said, it was also their first single since 1962's "You're For Me" not to reach number one on the U.S. country charts. At 36 tracks, The Complete Capitol Singles 1967-1970 offers an ideal introduction to the Bakersfield sound at the end of the 1960s, just prior to the mantle officially being handed off to the likes of Merle Haggard and, years later, Yoakam. It's not a matter of quantity over quality by any means as the group remains solid throughout; rather more that the sound was so well-established and, unfortunately, someone stylistically restrictive that there can't help but be something of a feeling of uniformity and assembly-line production to the songwriting process. "How Long Will My Baby Be Gone" manages to largely eschew the Bakersfield template, becoming something more akin to the burgeoning folk-rock scene, albeit dominated by Owens' vowel-chewing twang. It's no surprise then that "How Long Will My Baby Be Gone" managed to return Owens and company to the number one spot on the country singles charts. It would also prove to be one of the last singles featured here to reach that spot. After a five-year run of number one hits, the Owens' magic seemed to be wearing off. "Sweet Rosie Jones," also released in 1968, stalled at number two, while "Things I Saw Happening at the Fountain" failed to chart entirely. Regardless, The Complete Capitol Singles 1967-1970 is full of great representations of the Bakersfield Sound. Even the somewhat goofy "Happy Times Are Here Again" manages to get by on its charm, chugging rhythm and Owens and Rich's seamless vocal harmonies. And it's not just Owens with the Buckaroos represented here, as a handful of the singles are Owens collaborations with the likes of Buddy Alan – Owens' son and a solo artist in his own right – and Susan Raye, Owens' protégée and duet partner on a string of successful singles ("We're Gonna Get Together", "Togetherness", and "Your Tender Loving Care", to name but a few). 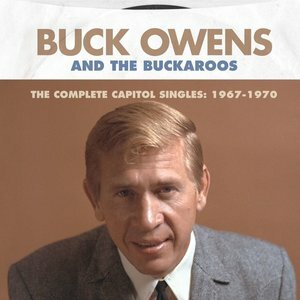 Not as essential as Omnivore's first installment collecting the golden years up to 1966, The Complete Capitol Singles 1967-1970 is nonetheless an integral part of the Buck Owens and the Buckaroos story, one well worth delving into for any fan of country music in its various incarnations.